Drone inspection of solar farms is an innovative and efficient method to identify defective cells of photovoltaic solar panels and read their serial numbers for record time replacement. 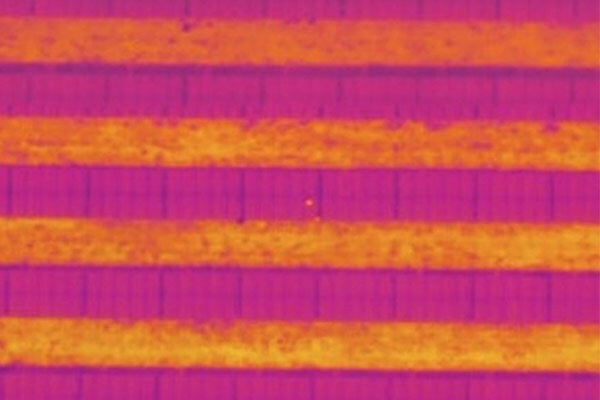 Orthophotographies of the panels give indications of the intergrity of the panels, while thermal analysis shows hot spots to take into account for further maintenance, avoiding weeks or months before taking action to repair defective elements. Our drones offer a large and high point of view on the installations of our clients, replacing or reducing the use of cherry pickers, cranes or aerial platforms. ROAV7’s UAVs inspect solar panels efficiently and in record time. Data processing in back office gives precise and reliable results allowing effective maintenance on the field. The deployment of UAVs is easy and quick, with almost no operational restrictions appart from weather conditions, and provides more details than traditional inspections. ROAV7 is specialized in high definition to provide the highest detail precision to its clients. With thermal and visual sensors, we assess defective cells, module breakdowns, dust and water accumulation.